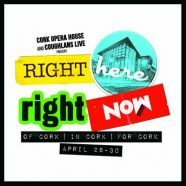 The inaugural Right Here Right Now festival took place in The Cork Opera House on 28-30 April. Coughlan’s Live and The Opera House joined forces to showcase the current wealth of talent in the Cork area and give these artists a chance to play in their cities most iconic venue. However, the spaces in use were not all ones that usual attendees of the Opera House would necessarily know. The traditional set up was in use, but so were two new exciting venues: The Green Room, and a new space which was created by letting the crowd join the band on the main stage. It was the traditional lay out which hosted the highlight of this excellent festival in the form of Jack O’Rourke’s collaboration with The Cork Opera House Orchestra on Saturday night. Anna Mitchell’s opening performance (also with The Opera House Orchestra) was stunning, no more so than when she performed a sublime cover of The Carpenters ‘Superstar’ which she dedicated to her mother. Anna’s latest single ‘Dog Track’ was the best of her own songs. Having your full album orchestrated is a dream most artists will never see come through so when the chance comes along you have got to grab it with both hands; Jack O’Rourke certainly made no mistake in this regard. From the first notes it was clear this was going to be something special. The tone was set with the exceptional opening trio of ‘Nostalgia’, ‘Naivety’ and album title track ‘Dream catcher’. ‘Silence’ was magnificent and gave me goosebumps. O’Rourke’s vocals twined with theses new arrangement were immense. The new arrangements gave life to songs I had previously overlooked too, in particular ‘Iggy’ and ‘Small Stuff’, while the outro of the brilliant ‘Shining For You’ sounded something like a James Bond theme. This project was clearly a labour of love for O’Rourke and conductor John O’Brien, this was evident from their embrace once the performance had ended. They were not the only ones happy with the show as the standing ovation they received from the sold out crowd confirmed. Marlene Enright’s set was the first I got to see on the new stage. The usual touring 5 piece had become a quartet so it was ever so slightly stripped back without the bass player. None the less this 6 song set was ideally suited to the Sunday afternoon crowd, lots of whom were nursing sick heads from the previous night’s revelries. ‘Bay Tree’ and ‘Sadness’ in particular were highlights as they warmed up the crowd for Mick Flannery. Mick Flannery’s excellent, sold-out, show on Sunday afternoon was the highlight of the gigs on this new stage as the singer/songwriter’s solo set wowed the early afternoon crowd. Flannery’s dry wit and self deprecating sense humour seemed to feed off the giddy crowd and at times Flannery got more laughs than a stand up comic, as between songs he regaled us with stories of imaginary, German friends and barn burning ancestors. However, as expected it was the music that made this show so special. It started with old favourites ‘Wish You Well’, ‘Red To Blue’ and ‘Get What You Give’ on acoustic guitar, before switching over to piano for a beautiful renditions of new song ‘How High’. The show came to an end with the magnificent ‘Safety Rope’, also performed on piano. My one regret from this set was, when ten minutes from the end Flannery asked the crowd the time and none of us had the wherewithal to tell him it was an hour earlier than it actually was. Later that Evening, The Shaker Hymn took to the stage in the dark and gloomy Green Room. This alternative rock 5 piece have been doing the rounds locally for quite some time but they have really come to the fore since the release of their excellent 2nd album ‘Do You Think You’re Clever’ in 2016. The brilliant ‘Trophy Child’ and the catchy ’Sucking It Out’ were the high points of an excellent set. Ian Whitty And The Exchange followed shortly after on the Green Room stage. Whitty had rose to some prominence a number of years ago and even graced the main stage in The Opera House back in 2009. However, since then he seemed to disappear off the radar until the release of ‘The Bottom Line’ late last year. The crowd seemed happy to have the adopted Corkonian back amongst them and ‘The Bottom Line’ in particular went down best. My own favourite was a song called ‘Absent Mind’. This fantastic festival weekend was drawn to a close by self professed “Blow In” Marc O’Reilly and his band of blues infused, folk rockers. O’Reilly was determined to finish the weekend with a bang and it was a mission he accomplished easily. The late night crowd were clearly entertained despite showing obvious signs of fatigue from the early afternoon start. The weekend was a resounding success and you would hope it is a festival that could run for many years to come. That show was absolutely wonderful. Anna Mitchell was great even if its not my type of music but she is huge talent. Strung were wonderful. BUT it was Jack O’Rourke was the one we came to see an dhear for the first time. Had seen feature on him on Echo (great paper) good while ago…as a consquence of that I checked him out on Youtube and heard Silence….was blown away. Heard him later being interviewed on Arena on radio and he explained the writing of Silence and sometimes when its radio with no visuals the words and voice are just there bare bones. OMG goose bumps is right and tears such a gorgeous song. Decided them we need to see this guy so hence why his gig at the Opera House. He is such a talent and the voice is amazing and his piano playing. We had never heard the Orchestra before so it was all such a special night. You could see Jack O’Rourke was chuffed with it all and he was soaking it all in while giving the audience such a treat. Your right the talent in Cork city and county is mindblowing and there is prob helluva lot more out there that we havn’t gotten to hear yet. I am telling anyone who will listen to go and listen to Jack O’Rourke. Wish him all the very best he has a bright future. Tell him to just keep his head don’t let the big comglomorates or record producers usurp his talent and tell him to enjoy it all. A bond movie theme tune now or a big advert for one of his songs and he is off for slates. Sorry didn’t get time to edit the above before submitting but ye get the gist….we are now Jack O’Rourke fans. He is such a modest person………keep writing, playing and singing Jack.